Each time I see someone wearing fur, a little bit of my faith in humanity dies. I think: “Here’s someone whose morals are mired in the Stone Age”. Fur production involves immense suffering—be it ranch-raised (where deranged animals circle for months in wire boxes before being electrocuted, strangled or clubbed then skinned, sometimes still alive) or wild-caught (where animals struggle for hours or days while a leg or foot goes gangrene in a steel-jaw trap, and babies starving when their mother fails to return). That it’s all completely unnecessary makes it all the more offensive. On my daily commute to work I display a large “Fur Shame!” button on my briefcase, next to another that says “Practice Nonviolence.” It’s my little way of expressing publicly how I feel about making innocent animals suffer for someone’s vanity, ignorance, or both. Last week on my commute home I chatted with a neighbor who told me she recently had her beagle euthanized due to advanced Lyme Disease symptoms that left him unable (or unwilling) to walk. She is an educated, articulate compassionate person, and she was still agonizing over her decision to end the dog’s pain. I asked if she was planning to replace her dog but she said she was reluctant as she is single and her long work hours mean that a dog is alone for long periods. I also noticed she was wearing a real-fur collar, probably coyote. I told her I was quite certain that it was fur and that the label would probably confirm this. 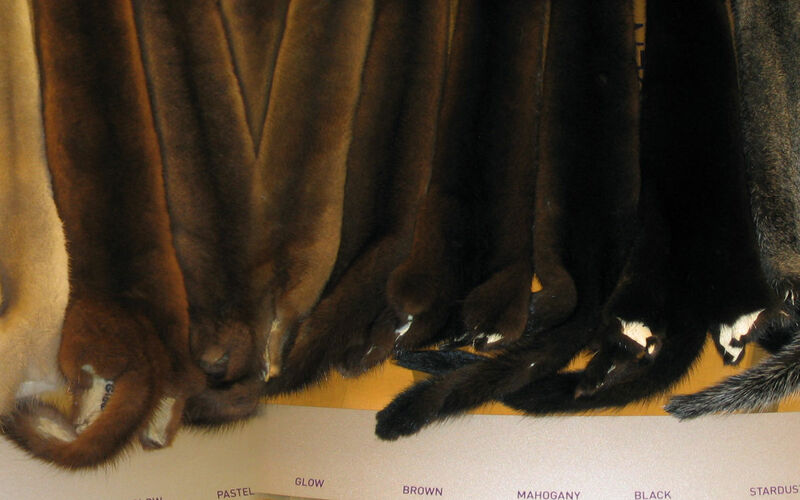 Fur Fact: Several coat manufacturers have been caught mislabeling real fur as faux. Which goes to show that I’m wrong to assume that fur-wearers just don’t give a damn. Many, if my neighbor is representative, are well-meaning but either careless or mis-informed. Perhaps there’s still hope for the demise of an industry that should have gone out with the invention of knitting.